Homecambridge first B2A dialogue taken from a recent exam of the FCE speaking part 1 section. 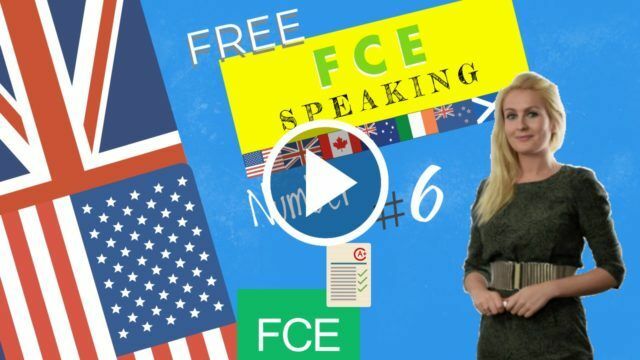 May 18, 2018 julia cambridge first B2 Comments Off on A dialogue taken from a recent exam of the FCE speaking part 1 section. FCE Course Lesson 7 – A dialogue taken from a recent exam of the FCE speaking part 1 with examples and exercises. Dialogue for the fce speaking part 1. In this lesson we will go over the main difficulties of the speaking part in the first certificate exam. The last part of FCE lasts 14 minutes. You will do the Speaking test with another candidate or in some cases 2 candidates. It is the shortest part of the exam and consists of 4 parts. EXAMINER: First of all we would like to know something about you. Let’s start with you Kelly. Where are you from? Speaker 1 (KELLY): I am from Valencia. I live in a small town called Alboraya. EXAMINER: Ok, and what about you Laura? Speaker 2 (LAURA): I was born in Argentina. I moved here when I was 3 years old because my father found a job here. EXAMINER: And what do you like about living here? LAURA: I love living here because it is my home, so all of my friends and family are here. The weather is great and I think the size of the city is perfect because it’s not too big, not too small. KELLY: I was going to say the same thing about the size of the city. It’s good because you can walk from place to place to get around the city but at the same time, there are still many things to do. I also love the beaches, the weather too obviously! The architecture is great too, especially the modern City of Arts and Sciences buildings. EXAMINER: What do you do to relax after a busy day Kelly? KELLY: Sorry, could you repeat please? EXAMINER: Sure, how do you relax after a busy day? KELLY: Oh sorry. Ok, well, to be honest, I struggle to find time to relax because I have a full-time job and 2 children! But when I put them to bed at night, I usually watch television with my husband and can destress myself a little bit then. EXAMINER: And how do you relax Laura? LAURA: I have a lot more free time on my hands than Kelly at the moment because I am unemployed! But most of the day I am looking for jobs on the computer, so at night I like to get away from this by reading a book outside or going for a run in the park. EXAMINER: Do you think you have a healthy lifestyle in general? LAURA: I would say so yes. I try to eat healthily during the week and I run three times a week, then at the weekend I indulge and eat whatever I like. EXAMINER: And you Kelly? How healthy is your lifestyle? KELLY: I think I’m pretty healthy too. I mean. I absolutely love chocolate so I guess that is my downfall. But I think that there is more to life than constantly thinking about what you eat. So I just make sure I exercise enough to make up for bad eating! Luckily, there is a gym at work which I can go to at lunchtime. EXAMINER: Ok and Kelly, what do you see yourself doing in 5 years time? KELLY: I hope to still be living in Valencia. I hope I still have my job and if I was being really optimistic, I would say I hope to have been promoted. LAURA: Well, fingers crossed I will have a job, which will involve my degree of architecture. I would like to still be living in Valencia but if no jobs come my way, I would be willing to move to another country for work. EXAMINER: Great. Let’s move on to the other part of the exam. Exam tip for the fce speaking part 1. Let’s see how to draw simple comparisons! Let’s imagine that we are comparing two photographs, two images. If we are drawing parallels we can use adjectives such as “alike”, “similar to”. A common theme here is family. Let’s try and contrast images now! We can use adjectives such as: “different”, “dissimilar”, “divergent”. We can say for example: “in contrast”, “on the other hand”. However, when we are comparing pictures, we don’t always have all the answers. So if you are uncertain, use adverbs such as: “maybe” or “perhaps”.